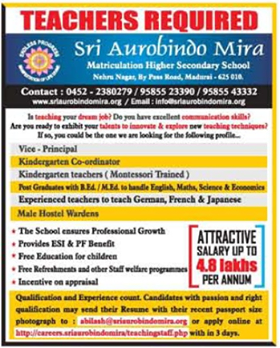 Sri Aurobindo Mira School, Madurai has advertised in Dinamalar newspaper for the recruitment of Teachers jobs vacancies. Interested and eligible job aspirants are requested to apply with in 3 days. Check out further more details below. About School: The mother defines education as free progress system; Progress guided by this soul and not subject to habits or conventions on preconceived ideas. These words make an indelible mark on us hence the name Sri Aurobindo Mira.